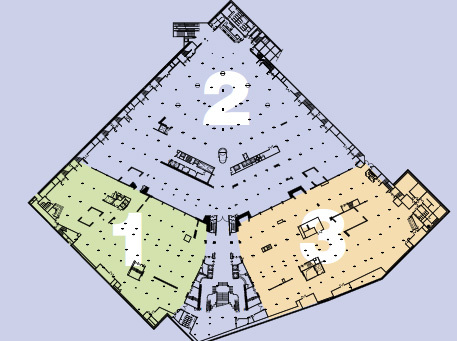 The Hall d’expositions is a vast modular space which can be divided into three separate and independent areas or used as a single space to form an exhibition space extending, on level 01, over the entire surface area of the main building of the Palais des Festivals. Accessible from the Croisette via the main entrance, the Hall d’Exposition extends on level 01 to the back of the Palais, where Le Puits de Lumière welcomes you to a lounge with bar and terrace. Le Puits de Lumière is also at the intersection between the Espace Riviera and the Hall d’Exposition.